If you’re here it means only one thing. You’ve been doing research for the best RV mattress and still unsure of what to buy. That is understandable as there are so many options. Well don’t worry as I’ve handpicked the top 7 mattresses that will make your RV feel like your own bed. As someone who lives in an RV I know what it’s like to sleep like a baby on a good mattress, and also toss and turn on a bad one. With the 7 mattresses here you don’t have to worry about the latter. Having spent a lot of time in RVs I’ve come to the conclusion there is a lot more to consider than just the price. Sure it’s important but even more so is how comfortable the mattress is. You also need to look at the brand and if it is from a respected name in the field. We’ll look at other factors too, but in the meantime let us go to the reviews. If you’re going to use your RV only on occasion, that does not mean you should settle for anything less than the best. This becomes even more critical if you’re living in your rig. So without further ado I present the best mattresses you can buy. How I Picked These Best RV Mattresses? First, all the mattresses here are meant for use on RVs. Even though they may look the same as the regular mattress, they’re not going to fit. Second I put emphasis on comfort and also durability as these mattresses will get a lot of use. The Zinus memory foam mattress consists of 4 inches airflow foam, 2 inches comfort pressure relieving foam and 2 inches of memory foam. The mattress uses Zinus technology for maximum compression but without compromising quality. The mattress not only looks good but feels good too. The mattress contains castor natural seed oil and green tea extract to fight off bacteria and prevent odor. The mattress has also been tested for durability to ensure that it is long lasting. The material is cool and soft and offers relief for those hurting joints and muscles. The size is also ideal for most RVs. This classic mattress from Live and Sleep is comprised of 2.5 inches of foam. These are air infused foam set on firm base, giving you comfort and support. The mattress comes in various sizes to fit your home or RV. The mattress provides relief for pressure on your joints and keep your body cool. The cover can be removed and washed with ease. This makes it appropriate for use in RVs. Putting the mattress in an RV does not present any problems and once in place should fit nicely. Of course it all comes down to comfort and the Classic does not disappoint. The Ultima is comprised of three layers, starting with 5 inches of base foam support. It also has 2 inches of foam that provides pressure relief. These are topped off by 3 inches of memory foam for comfort and rest. A lot of mattresses use memory foam true, but the material here is exceptional. The Ultima uses only the latest Big Foam in lieu of regular petroleum. This mattress uses natural plant oil so it is more comfortable to sleep on compared to others. Its use of Big Foam makes a big difference in terms of durability and breathability. At the end of the day this is the kind of mattress you’ll want. 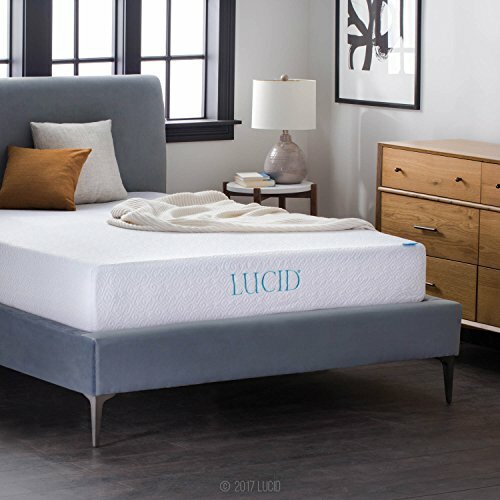 The Lucid 10 has a dual layer mattress, a 7.5 inch base and 2.5 inch top. The base consists of memory foam with ventilation and infused with gel for extra comfort. The base is firm foam and offers excellent support. If you lie on the bed you’ll notice how comfortable it really is. The fabric cover is made of TENCEL, a special material that controls moisture. TENCEL also serves as a temperature regulator. Another thing worth noting is the mattress is well suited for RVs. Because the mattress remains cool you don’t get that warm sticky feeling you get with other mattresses. The DynastyMattress lives up to its name, keeping you cool and breezy for a good night’s sleep. Its gel foam is 3 inches thick and it has a 5 inch foam base for support. The mattress also comes with a 2 inch airflow foam. What all this means is relief for joint and bone pressure when you lie down. This 3 layer design is made from the highest quality materials for maximum comfort. The mattress also comes with a washable cover, two foam pillows and a beautiful white cover. This is pretty much a complete set so you’ll have no need to buy a new set of pillows or covers. The Best Price mattress consists of high end polyester and has been CertiPUR-US certified that attests to its durability. The 2.5 inch base foam is high density and topped with 1.5 inch memory foam. The effect of all this is the mattress provides soothing relief for your back without sinking. The mattress uses motion transfer so partners feel comfortable while they sleep. Even when you move your partner’s side of the bed doesn’t so you don’t disturb their sleep at all. This is a feature that should appeal to a lot of couples who have different sleeping habits. Add the fact that the mattress is durable and you’ve got a winner here. As the name makes plain, the InnerSpace mattress is for use on RVs only. It is made from 5 and half polyurethane foam for comfort and maximum durability. The reversible nature of the InnerSpace makes it more versatile than other mattresses too. If one side is beat up you just flip it over and the mattress is good as new. The InnerSpace comes in an assortment of sizes to satisfy your RV needs. It also comes with a 15 year warranty so that should set your mind at ease. One of the most common complaints when it comes to RV mattresses is they don’t last, but that’s not the case here. After you have installed the bed it’s good to go. First off you can’t use a typical mattress as it’s too big. The mattress on an RV is six inches shorter by 6 inches. This is because space is a premium in RVs so you need to take that into account. Buy only mattresses meant for RVs so you’re assured they’re going to fit. Requirements vary from person to person, but what it really comes down to is comfort. Choose a mattress that is as similar as possible to the one you use in your house. It’s going to take some getting used to especially since it’s shorter and you’re in an RV so it helps to have a familiar place to sleep on. If you have never slept on a motorhome mattress before, it really isn’t that different from a typical mattress except that it’s smaller. You also get to choose from a lot of options. If you’ve got a mattress and don’t want to get rid of it, get a memory foam topper. They’re less expensive compared to buying a new mattress. But if money is not a problem and you’re going to buy furnishings for your rig, might as well get a mattress. A mattress topper is ideal if your current mattress isn’t to your liking but don’t want to splurge on a new bed. While it is cheaper than a new mattress, it can slip off and wear out with constant use. If your mattress is too large for your RV then a topper can’t help. And the cost of mattress has gone down that it is now a practical option. Make sure it folds into a compact shape and the mattress folds along the frame. You may or may not use a topper, but if you do make certain the mattress is of the right thickness. If you want to use a thick topper with that sofa bed, just remove the topper when you fold the sofa bed. There are some regular beds that you may be able to use on n RV, but you have to be certain that it is the right fit. It is up to you whether to just sleep on the mattress or use a topper. Pop ups are small and fit nice in a motorhome, but they’re usually thin and quite uncomfortable. This is one instance where it’s better to use a topper or a thick mattress. Depending on the size of your mattress you may be able to keep the topper on or have to remove it. What it comes down to is space. If you’ve got a large RV then get the biggest, most comfortable mattress you can find. If space is at a premium then you should settle for a smaller mattress. You should still fit comfortably though and avoid those where you feet stick out or is right at the edge. If you’re on a budget and can’t afford a new mattress, buy a mattress topper. If your RV doesn’t come with a mattress, buy one that is made specifically for motorhomes. Sofa beds are nice if there is limited space in your RV. This is also worth considering as it can double up as a bed and couch. If you have limited space or have a guest sleeping over, a sofa bed will do. Pop ups are compact and suitable for campers and small RVs. But they’re not as comfortable as the other beds. The biggest advantage of RV camper beds is they fit right in. You don’t have to struggle with getting them in the unit. For that alone they’re worth getting. Buying a camper bed or mattress may entail extra expense but this is only in the beginning. If your RV does not have a comfortable bed, you’ll be forced to sleep in hotels, motels and other lodging places and they’re not cheap. These mattresses are also designed for long term use. 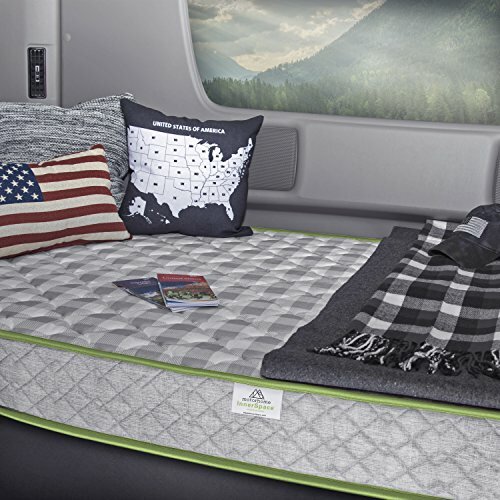 Unlike regular beds they’re more durable and can take heavy use even when you’re driving around. The following section reveals the factors you need to look at if you want to buy the right mattress for your RV. Some RVs have a mattress included but for the most part they’re of low quality. You’re going to be better off buying a new mattress or a topper. If you do go for a mattress, check the material and how many layers it is. Research as much of the material as you can so you’ll know what you’re going to get when you place that order. If you’ve got an old mattress or the one you bought isn’t comfortable enough, you can put a topper on to remedy the situation. 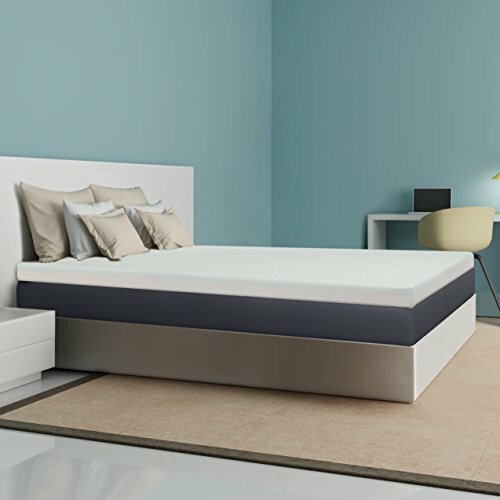 Toppers are also ideal for sagging mattresses as they provide extra firmness and support. Toppers come in various sizes and shapes, so you need to choose the one that corresponds to your mattress. If your RV has sofa beds the only real option is a topper. As mentioned earlier, don’t keep the topper in the sofa bed when you fold it. Ensure there is enough space on your RV when you unfold the sofa bed. Your best option is a narrow topper that is still comfortable. A thick topper doesn’t work with these so you have to find the right balance between thickness and comfort. If you’re in a small RV and don’t mind a compact, firm bedding, then a pop up will do. The following are the most common types of beds you’ll come across. They’re made by different manufacturers so the density, softness and hardness will vary. Some have multiple layers that directly affect they way the material feels. This is the standard provided in motorhomes. Most are 5 to 6 inches thick and won’t cost you a thing since it’s included in the RV. But they’re not the most comfortable or durable. If you’re lucky enough to get a nice soft mattress with your RV then good. If not you can always choose one of the options here. Memory foam mattresses are comprised of multiple layers. Usually there’s a firm base support, a middle layer and the memory foam on top. It’s a good choice if your main objective is comfort. Memory foam is the most popular choice nowadays and it’s not hard to see why. They’’re versatile, built to last and easy to maintain. Latex is a lot like memory foam when it comes to comfort. It is made from durable materials and should last a long time. Latex materials have antimicrobial properties and resistant to dust mites. Both are important especially for RVs. 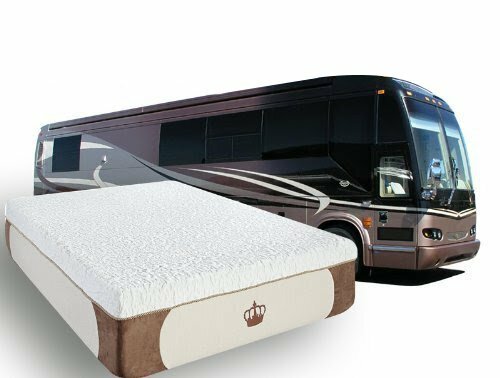 Coil or innerspring mattresses are comfy and durable, but they’re heavier than latex and memory foam and that’s a problem for RVers. Innerspring beds also have metal that makes it vulnerable to condensation and rust. Some mattresses have gel to keep the material cool, and it is a good option if you spend a lot of time in warm locations. The gel beads are placed in the mattress, keeping it cool. Air mattresses come in a wide range of forms and styles. Choose one that fits your RV and budget. 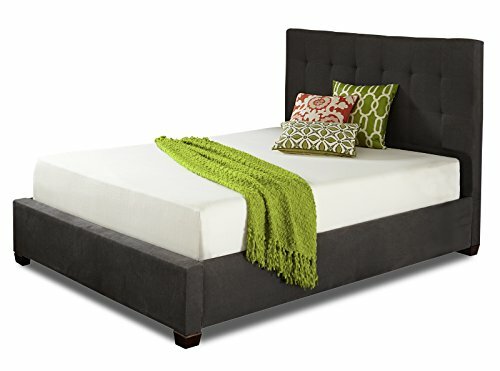 So which of these mattress materials is the best option? The choice is really up to you and how often you’ll sleep on it. Here’s a quick overview of the various RV mattress sizes. A regular twin mattress is 38 x 75 inches, but those for RVs can range from 40 x 80 to 28 x 75. These are also the same sizes for pop ups and campers. 75 inches is the average length, but the width varies from 28 too 35 inches. A few irregular sizes are also available so check if that particular mattress fits in your RV. Full or double mattresses for RVs are about the same size as regulars. Some RV full beds are even wider by an inch. The three quarter mattress is 75 percent as wide as a regular queen mattress. So rather than 60 inches this mattress is 48 inches. These mattresses fit in nicely in various RVs. Measuring 60 x 80 inches, queen size mattresses are common in RVs with several sleeping sections. Short queen mattresses are 60 x 75 inches so they’re shorter than regular queen beds. This is a good choice if your motorhome doesn’t have enough square footage but you have to accommodate several people. These mattresses are wider by 6 inches compared to the regular queen. At 66 inches, Olympic size queens are better suited for larger RVs. RV king size beds are either 72 x 80 or 72 x 75 inches. It is smaller than the 776 x 80 inch beds found in homes. An Eastern King mattress is wider than a standard king, coming in at 76 inches rather than 72. This is suitable for couples who want more space. A Cal King RV mattress is 72 x 80 inches, smaller than the regular 76 x 80 inches found in homes. Even so the extra length makes this uncommon except in long RVs. Trailer beds or truck beds are available in two sizes, 42 x 80 inches and 35 x79 inches. RV mattresses are firmer than the typical one found in homes so you have to keep that in mind if you plan to spend a lot of time on an RV. The good news is most are made of memory foam so they’re more comfortable now. Check the return policy from the vendor so you can get a refund if the mattress is too soft or too hard. Everyone has a different preference so the only way to find out is to buy the mattress and sleep on it for a few days. How you sleep plays a part in determining what type of mattress to get. Some like the mattress firm, while others want it to conform to their body’s shape. Another feature you may want to look at is isolating the sleeping position so when you move you don’t disturb your partner. A well made mattress has cooling properties so the material doesn’t get hot when you lie down on it. A cool mattress is particularly important if you travel to a lot of warm areas during the summer. No need to go into a lengthy explanation for this one. A comfortable mattress is nice but it must not come at the expense of durability. Look for mattresses with a strong base support to hold up the upper layer. The cost varies according to the features, size and where you buy from. It never hurts to look for discounts but don’t let price be the primary factor. Instead of just choosing the cheapest mattress, it is better to look at it in terms of value. If you want to buy a memory foam mattress for instance, make a list of the features you want and compare the price. Q – Can these RV mattresses be replaced? A – Most of the time manufacturers will be happy to provide you with a replacement if the mattress arrived damaged. You can also get a refund if you return the product within the provided time period. Q – Where can I buy these beds? A – Mattresses are available in shops around the country, but the best place to buy is definitely online. It is often cheaper and you can choose from a wide range of products. Shopping is no hassle too and overall online is just the better choice. Q – Where to find replacement RV mattresses? A – The best place to look is online. Check the vendor for its refund policy and warranty coverage. If you want to replace the mattress due to damage, contact the manufacturer or the online retailer and they’ll have it replaced. Q – Which type of RV Mattress is best? A – This is a matter of personal preference because some people like their mattresses firm while others want it soft. You should read the product description to get an idea of how hard or soft the mattress is going to be. Q – What If you can’t afford a new RV mattress? A – A mattress topper is the best solution. Get one that is 3 inches thick, put on top of your current mattress and it’s going to feel like brand new. Do not use egg crate foam beds as they’re not comfortable. 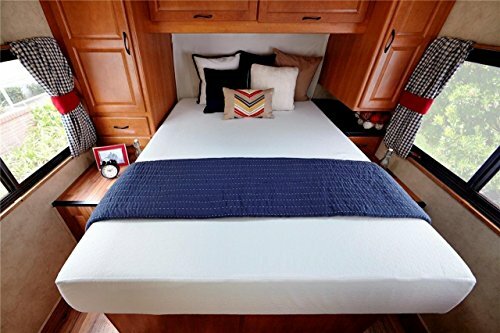 How to Find a Specific RV Mattress? To approach this situation, read product reviews like the ones in this guide. You should also go to the manufacturer website for more details. Make a list of the features you’re looking for, the type of material, thickness and so on. Use that as a guide to help you find the right mattress. Mattresses for motorhomes are so important as driving a hulking vehicle like an RV takes its toll, and at the end of a long day, you just want to lie down and relax. With the right mattress your RV definitely feels like home.